A First Holy Communion is a precious and momentous milestone in a boy’s life as he walks into his spiritual life. 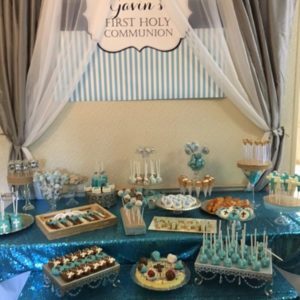 To celebrate this special milestone, Gavin’s mom Tricia organized a First Holy Communion celebration for Gavin together with their friends and family. This elegant candy buffet set up for Gavin’s First Holy Communion, perfectly matches our navy blue striped First Holy Communion banner. The desserts have been perfectly prepared to match the the blue and white theme, even down to the finer details such as a cross on the cookies and cake pops. Gavin’s First Holy Communion celebration is sacred, simple and sweet, making it a wonderful day to remember by his family and love ones. Thanks Tricia for sharing this wonderful picture of Gavin’s First Holy Communion.